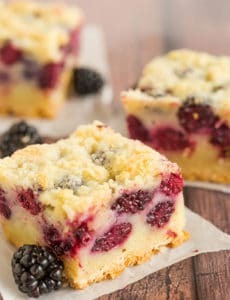 Blackberry Pie Bars - A shortbread crust, a creamy, custard-like blackberry pie filling, and a crumb topping. Make the Crust: In a large bowl, combine the granulated sugar and the lemon zest. Using your fingers, rub the zest into the sugar until all of the sugar has been moistened. Whisk in the flour and salt to combine. Add the butter and use a pastry blender or two knives to cut the butter into the dry mixture until the pieces of butter are no larger than the size of peas. Measure out 1½ cups of the crumb mixture to use for the topping and put it in the refrigerator until needed. Press the remaining mixture into the bottom of the pan in an even layer. Bake the crust until golden brown, about 15 to 20 minutes. Set on a wire rack while you prepare the filling. Make the Filling: In a large bowl, whisk the eggs until thoroughly combined. Add the sugar, sour cream, flour, and salt, and whisk until the mixture is completely combined and smooth. Using a rubber spatula, gently fold in the blackberries. Pour the mixture evenly over the crust and use the spatula to ensure the filling mixture is evenly spread over the crust and the blackberries are sitting in a mostly single layer and not bunched up anywhere. Sprinkle the reserved crust mixture evenly over the filling. Bake until the top is lightly browned, about 50 to 60 minutes. Place the pan on a wire rack and cool for at least 1 hour before slicing and serving. Leftovers should be stored in an airtight container in the refrigerator for up to 3 days.